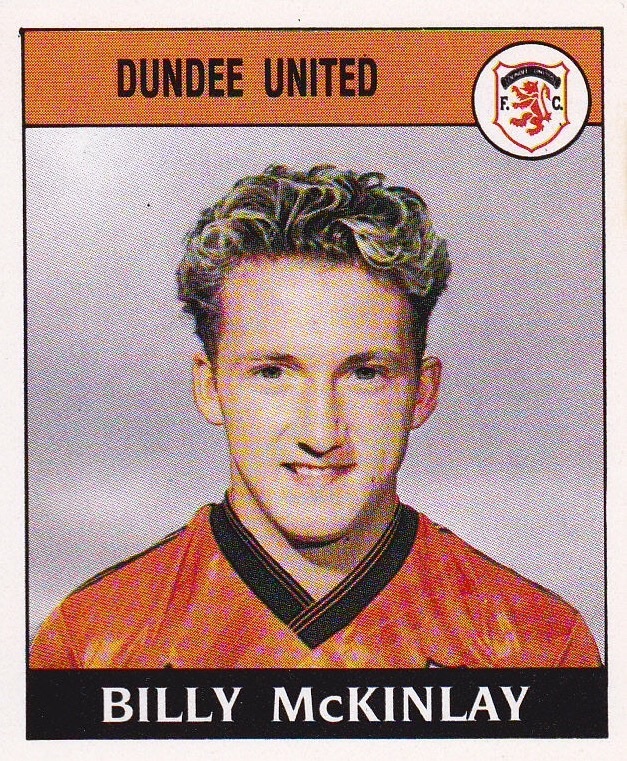 Billy was a schoolboy international who joined United on an 'S' form in March 1984 whilst he was with Hamilton Thistle. Within eighteen months he had signed a professional contract, playing regularly in United’s reserves and was part of the Scotland Under-16 squad. 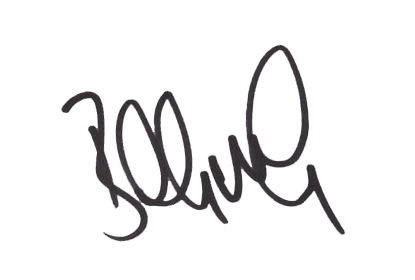 An attacking midfielder, he made his debut aged 17 against Hibs at Tannadice in November 1986, and four days later impressed greatly in a UEFA Cup game against Hajduk Split - a match in United's famous run to the UEFA Cup final that season. 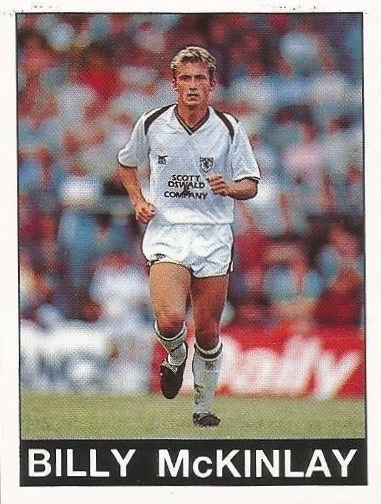 Having been a member of the Scotland youth squad, he progressed to Under-21 level during the 1987-88 season and received widespread praise having appeared in the Scottish Cup final against Celtic at Hampden, collecting a runners-up medal. 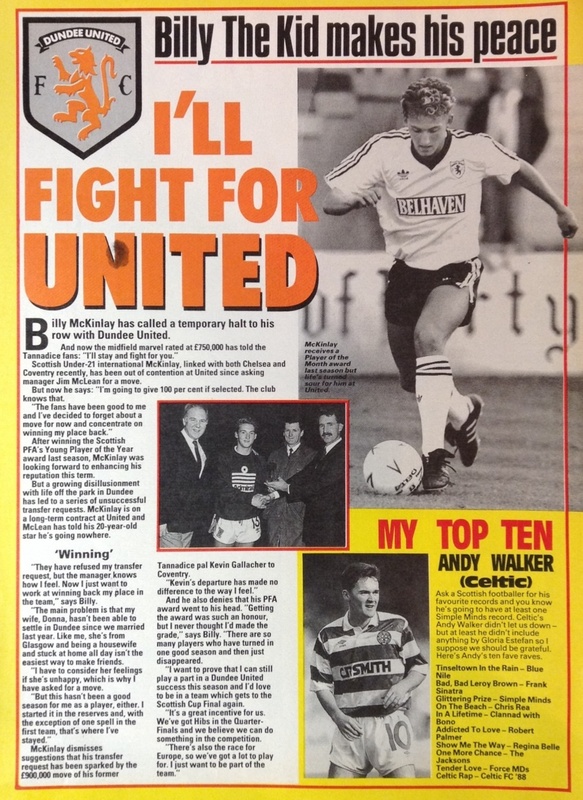 Now a regular in the United starting eleven, Billy was voted the SPFA Young player of the year for the 1988-89 season. 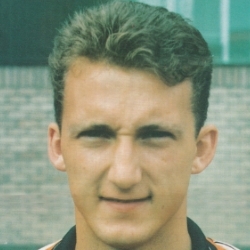 With interest from Chelsea and Coventry City, the midfielder had a transfer request denied by the club, and manager Jim McLean dropped the talented youngster for a spell after a dip in form. 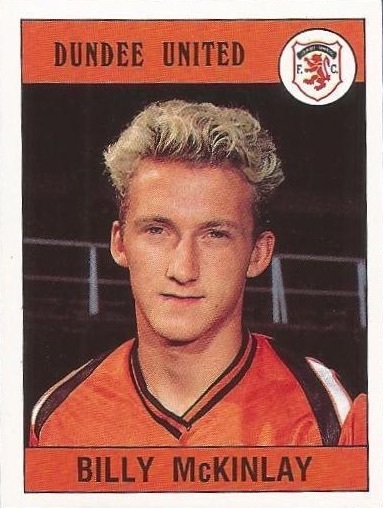 However, he fought his way back into the first team, and became a Scotland B international in March 1990 with a substitute appearance against Yugoslavia at Fir Park. He was called up to Andy Roxburgh's Scotland squad for a European Championship qualifier against Switzerland in October 1990, but he would have to wait a bit longer for his international debut. 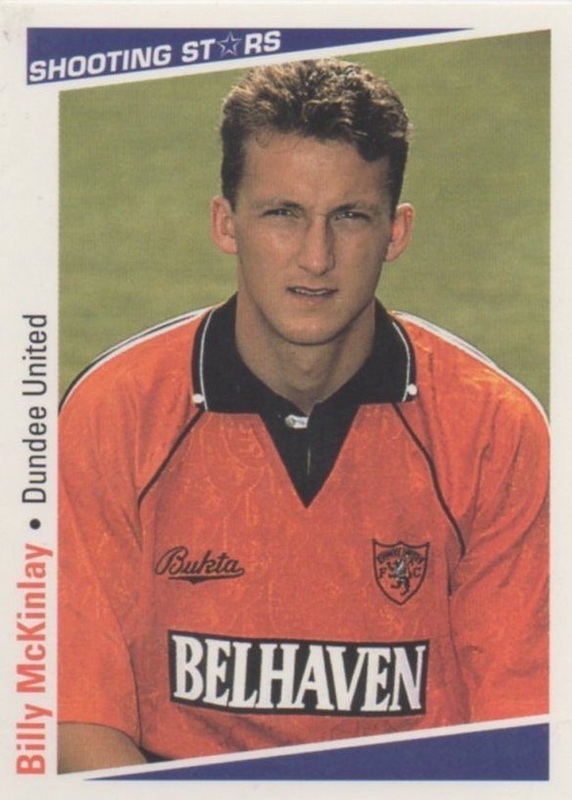 By the end of that season, he had helped United reach the 1991 Scottish Cup final, where United lost out in a classic match, with McKinlay picking up his second runners-up medal. Just as he looked to be hitting peak form, a broken leg in December 1991 kept him sidelined for the rest of that season, but he was soon back in his usual berth. He then went on to have his best spell at United, and in November 1993 he made his full Scotland debut against Malta. 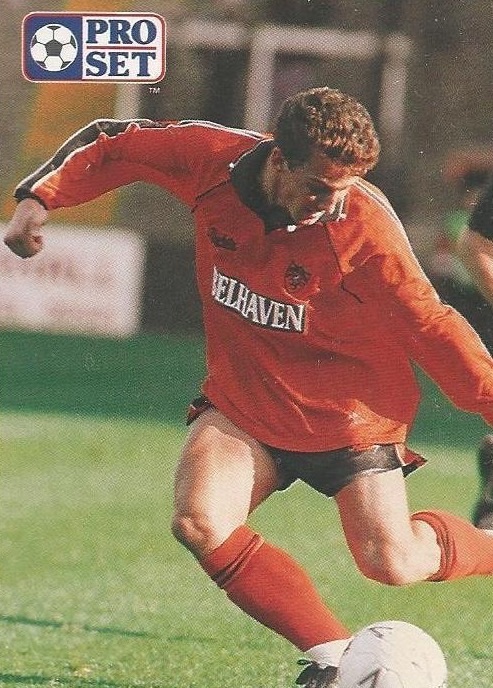 He was an important part of the team in United's run to the Scottish Cup final, scoring in earlier rounds against Arbroath and Airdrie. 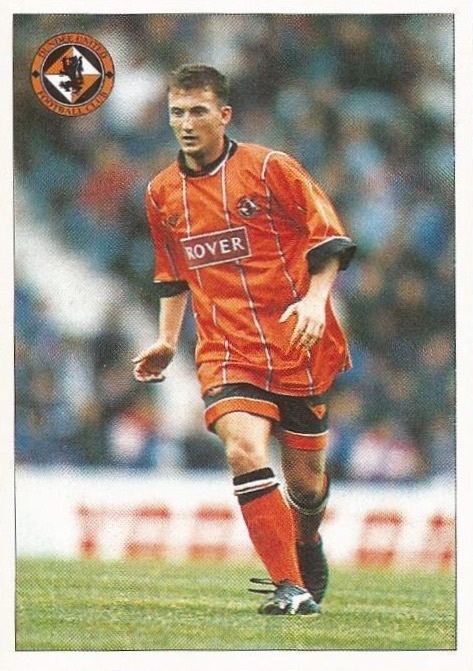 He played in every match except the final itself, missing out due to suspension after a yellow card at Fir Park a few weeks before the match at Hampden. During the 1994-95 season, there were many rumoured bids and interest from several English clubs including Aston Villa, Everton and Manchester City, and after United were relegated from the Premier Division, that interest intensified. He made 14 appearances for Scotland during his time at Tannadice, the last two as a First Division player - making him one of only three players from that division to play at full international level for Scotland since 1975. 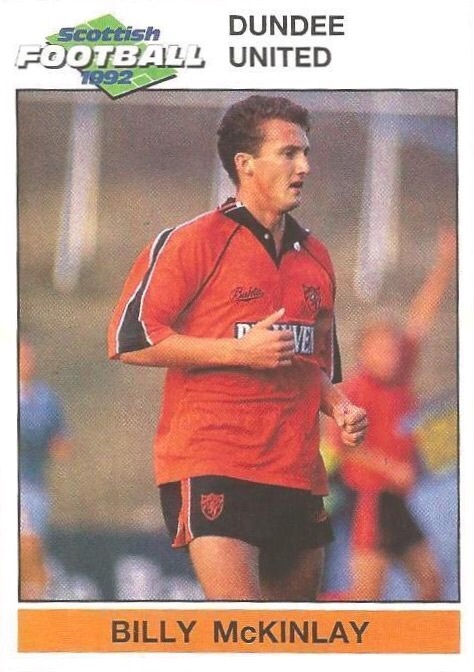 In September 1995 he turned down a move to Celtic and then signed for Blackburn Rovers for a fee reported at £1.75m - his parting gift to United fans being a memorable hat-trick in a 3-2 win over Dundee at Dens Park. Billy was born on this date in Robroyston, Glasgow. Our stranglehold over Hibs continued with this narrow but deserved victory. The manager-less Easter Road side. as expected, proved a tough nut to crack and only a goal just before half time gave us the points. We started well but Irishman Mark Caughey should have put Hibs ahead in the 18th minute when he met a cross at the near post and somehow managed to shoot past the far post. From then until the interval we were on top and finally got our reward when Paul Sturrock's corner from the left was headed strongly downwards past Alan Rough by Eamonn Bannon. 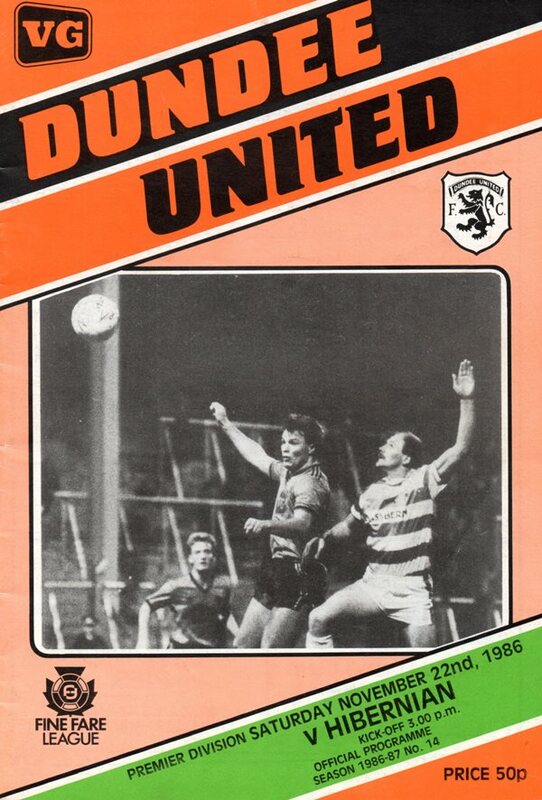 This was a match that started innocuously enough, but for some reason developed into a bruising affair with Hibs losing the services of two players who were red carded and a further two were booked as were Billy McKinlay and John Clark. Regrettably, the match will be best remembered for the field offences, which tended to obscure any football on display. The first half contained little of note in a playing sense. George McCluskey shot over and Eamonn Bannon made contact with a long John Clark free which Gordon did well to smother. The first derby match of the season attracted the biggest gate in the First Division this season. Grant Johnson came in for the injured Paddy Connolly and that was the only change in the United line-up which lost to Airdrie the previous Saturday.